This creamy dressing is an exquisite mixture of natural ingredients (basil, coriander, parsley), that serves to enrich in a healthy way any salad or main course with fish , chicken , cheese , etc. – But that’s not all because it also gives a very special fragrance and freshness to the dishes. 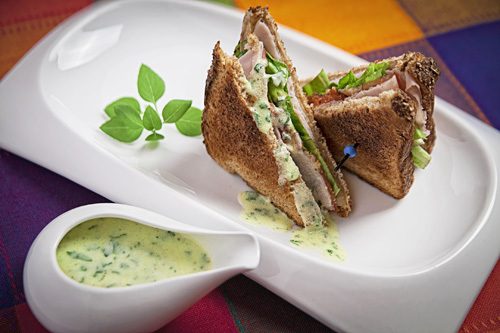 Likewise, the creamy dressing to the herbs can also be used to complement sandwiches and tortas. The creamy dressing is super easy to prepare, you won’t have any problem. To make this dressing natural yoghurt is used, which doesn’t have to be sweetened. We recommend using fresh herbs so the dressing will be full of aroma and flavor. In case of not having them handy dried herbs could also be used, use 1 tablespoon of each herb (basil, coriander and parsley). In 5 minutes or less your dressing will be ready. This recipe will yield approximately 1 cup of dressing. Finely chop 1 coriander sprig, 1 parsley sprig and 6 fresh basil leaves. Upon completion put all these herbs in a bowl. 3 tablespoons of Natural Yoghurt. 3/4 cups of Olive Oil. Mix very well the creamy dressing to the herbs with a balloon whisk or with a mixing spatula. Tip: If only part of the dressing is used, cover it and store it in the fridge. This delicacy can still be enjoyed for 1 week. Variation: Discover the cuaresmenos creamy dressing ! Did you like the Dressing? If you need fresh basil this one has a very good aroma and flavor – perfect for your dressing. Use a bowl with silicone base, because they are very stable and it is easier to mix the ingredients. Use a kitchen scale to have the correct weight of the ingredients and your recipes will come out perfect.